Today we had our first non-family guests over to the house. Some of the women from the Tennessee Valley Crafters group. We talked, and laughed (and laughed, and laughed : ), and ate, and sort of worked on crafts. It was lovely. I began work recovering pillows for our bed. 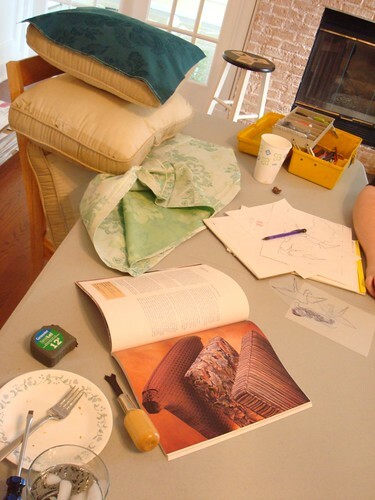 You can see the pillows, the lovely teal fabric, my instruction manual, some tools, and evidence of my friends. A house just feels so much more homey when filled with good friends and good food.